Pest Control osrs is a fun and safe minigame you can play on OSRS. It’s combat-based and co-operative and your main goal is to defend the Void Knight from monsters and to destroy the portals from which they spawn. • First things first, if you want to play, the official Pest Control osrs world is 344 (P2P), so you might want to hop there. • Pest Control is a members-only activity. • When we say Pest Control is a “safe” minigame, what we really mean is that when you die in it, you get to keep your items, respawn on the lander and if you wish, rejoin the battle right away. • At the end of each game, run energy, special attack, hitpoints and prayer points get completely restored. • Same goes for all stats, they go back to their normal level so it’s important to remember stat boosts from different potions don’t carry over from one game to another. That’s why you’ll need to buy a lot of OSRS gold if you want to use stuff like Super sets. • The game can be played by 5 to 25 players. If it fills with the maximum amount of players, the game begins automatically. If not, you have to wait 5 minutes after at least 5 players have boarded the lander in order to start. 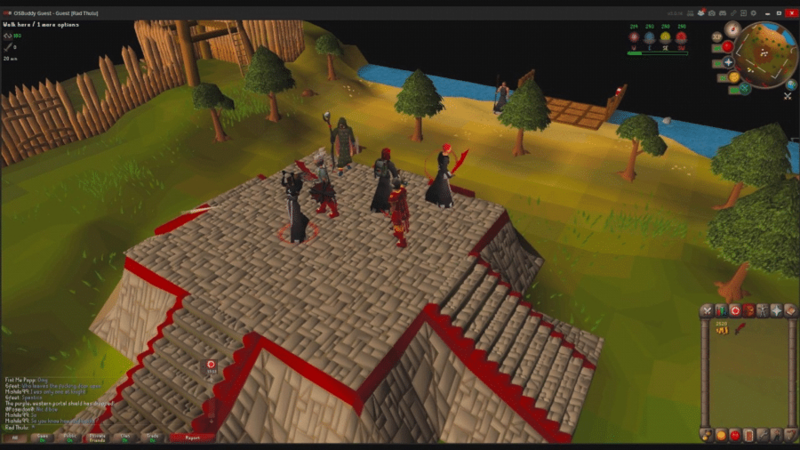 • Pest Control osrs is located on the Void Knights’ Outpost on one of the south islands in the game. You can reach it by ship from the docks of Port Sarim south of the Lady Lumbridge where you need to speak to the Squire. The fastest way there is through the Minigame Group Finder but it has a 20 min cooldown and can’t be used from a PvP area. Another way is by direct Pest control teleport which you get as a reward from Treasure trails or may buy from someone. There are three landers which players board. • The minimum combat level you need to use the novice lander is 40. • If you want to use the intermediate lander, you must have combat level over 70. • To use the veteran lander, your combat level should be at least 100. A common thing for Pest Control osrs is that people (usually from one clan) want to attract high level players to the world where they’re playing the minigame, hoping that they can help win more games for less time. If you see someone saying stuff like “Trade for a 100 plus world”, that’s probably what’s happening. When you open the trading interface, even if no items are offered, the advertiser verifies the combat level of the other player and will tell them the number of the world where his clan is playing, usually by offering a number of coins that is the same as that of the world. F.e. if they’re playing in World 308, they will offer you 308 coins total. In the name of Guthix you need to keep the balance in the world when it’s disrupted by waves of monsters that keep invding the islands in the south. It’s run by the Void Knights. Players board one of three available landers and get transported to the invaded islands. The goal of your team is not just to fight the monsters though – you need to protect the Void Knight too. The game can only be won if the players destroy all four portals which spawn monsters or if they defend the knight for 20 minutes. Usually the portals can be destroyed faster but it’s not wise to leave the knight unguarded since he might be killed before the players manage to destroy the portals. If the Void Knight dies, the players lose. That’s why it’s best to leave some players to defend the knight and to ship the rest to the portals. However, since the game can sometimes last less than 2 minutes and the players rarely organize themselves, you can also just check after you destroy the portal to see if the Void Knight has more half health and if not, you can switch to defence. A portal kill grants the knight 50 hitpoints. When the game starts, all portals have a shield on which makes it impenetrable so you have to wait until the Void Knight disables the shielf before you attack. First shield goes down in 15 seconds, then each one of the rest follows at 30 seconds intervals. You will be notified when they drop. The novice lander starts with 200 hitpoints, while the intermediate and veteran ones have 250. You get full restoration once the minigame is completed and it’s short, so it’s a good thing to use offensive prayers, especially Retribution prayer. If you want to get any commendation points, you have to constantly maintain your activity bar when you’re in the minigame. If it drops below the requirement, it turns red and you get no points for the game. Attacking standards enemies increases your activity moderately, while attacking portals or spinners awards you with a bigger increase. Repairing barricades and gates also helps – in order to do it, you will need a hammer and it’s a good idea to finish beforehand the Easy Kandarin Diary for Kandarin headgear which gives double log output from regular trees. You get 5 Crafting xp for one repair. This entry was posted in How-To Tips & Tricks, Latest OSRS News, Old School RuneScape, OSRS Mobile App and tagged buy OSRS gold, for melee, no hp xp, pest control, pest control gear, pest control guide, void knight, void mage, void melee, void range. Bookmark the permalink.